Remember the function served by plants and structures is more important than their appearance. In other words, don't base your planting decisions solely on what a plant looks like. 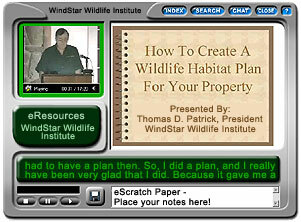 Following are WindStar Wildlife Institute's plant recommendations for wildlife habitats in Oklahoma. Oklahoma is a land of flat, fertile plains and low hills. Oklahoma's plains also host large herds of cattle and vast wheat fields. The geographical landscape of Oklahoma is comprised of 10 separate land regions. The Ozark Plateau is marked by rivers with steep valley walls separated by broad flat areas. The Prairie Plains produces most of the state's coal and a great deal of oil. The Ouachita Mountains are sandstone ridges, running east to west, to form the roughest land in Oklahoma. Spring-fed streams run through narrow valleys between the ridges. The Sandstone Hills Region are from 250 to 400 feet high. Some are covered with Blackjack and Post Oak forests. The Arbuckle Mountains comprise an area of about 1,000 square miles in south-central Oklahoma. The low mountains rise about 600 to 700 feet above the plains. The Wichita Mountains are found in southwestern Oklahoma. The Red River Valley Region in southern Oklahoma is characterized by rolling prairie. Some forested hills can also be found in the area. To the west are the Red Beds Plains which is the largest land region in Oklahoma. The Gypsum Hills are low (150 to 200 feet) hills capped with 15 to 20 foot layers of gypsum which sparkle in the sunlight because of their gypsum content and, because of this, are sometimes called the Glass Hills. The High Plains are level grasslands. The Oklahoma Native Plant Society can provide lists of plants for a specific region.